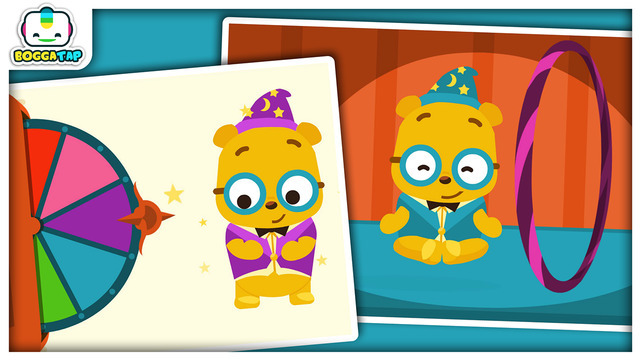 Let your kids create their very own magic show, with the help of a ticklish teddy bear! "Bright, clean colors and smooth, intuitive game play." Give your kids a touch of magic and appetite for wonder! Magic tricks are not only fun - they also spark creativity: Anything is possible! With Bogga Magic, children can explore the performing art of illusions, and best of all - join the show. There might also be some hidden tricks somewhere. Can you find them all? "Open ended play that encourages children to explore." "Bogga Magic is a high-quality app. Intuitive and easy to use." "Toddlers and preschoolers will love playing with it. Recommended." "Gives kids a 'magical' entertaining experience with an educational twist." "Allows kids the opportunity to combine objects without restraint." "Magic and humor in a charming show." Bogga Magic is recommended by Aridan Books educational app resource guide: "A magical app providing essential practice in reasoning, language, sequencing and a host of other readiness skills while learning to be a master magician." Boggatap is a small, independent game studio that creates playful apps for kids. We focus on safe and inspiring play and therefore have no third-party advertising or in-app purchases. We also do not collect, transmit or access any personal information from the user. The only links to internet, including integration with social media sites, resides in the "For grown-ups" section with a parental lock - making it unavailable for small hands. The app does not generate any performance reports or track any usage. We are approved by Moms With Apps and ACT, a staff of parents and educators who filters safe apps for children, with no unwanted surprises.